Good morning guys! I've been trying a lot of new things lately, so I thought I'd review one of them today. 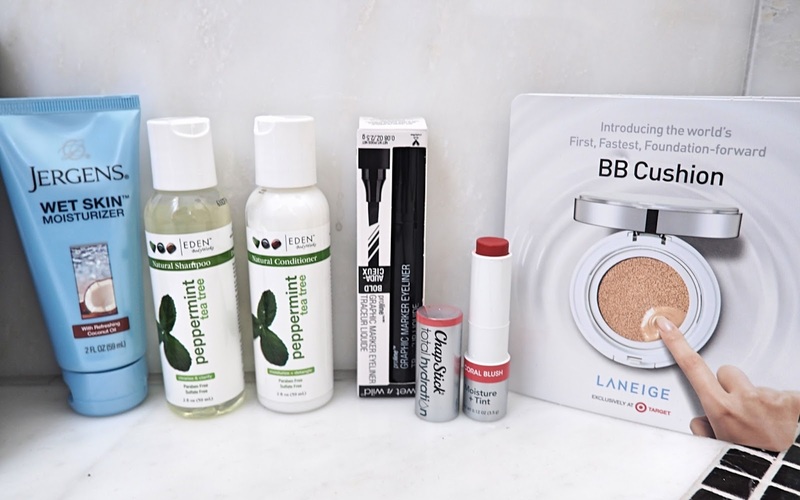 I don't know if you've heard, but Target does their own monthly beauty box and it's under $15!! So, I had never heard of the Target Beauty Box before October. I've seen and even paid for lots of other subscription boxes before but was never happy with them. I felt like the products weren't really things I could use on a daily basis, didn't go with my taste at all, or just were too small for the price I was paying. When I heard Target, I immediately thought, "That'll be SO affordable!" and boy was I right! This particular box was only $7, but I think they can go as high as $15, which is still a bargain. I got 7 products, ranging from tester to full size. (One is missing from the above picture, but I'll still discuss it below.) When I opened the box I was immediately happy with the range because everything was something I can/will use and I love that I can use some of the things for traveling. So far I've tried everything but the peppermint shampoo and conditioner, but I'm sure I'll like it just like I have with the others. 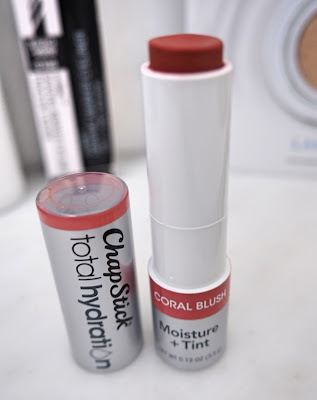 My FAVORITE from the box is definitely this ChapStick moisture tint lip balm. I got the color "coral blush" but there are a few other pinks and reds available. I was so skeptical because I normally hate tinted lip balms...they either don't show up or they're not a match at all for my skin tone. This one is PERFECT. The coral color will look great on so many people as it's not too pink or too orange. It smells like koolaid and truly feels like there is nothing there. I love the way it adds a bit of color and it has great staying power! I would totally repurchase this one. Jergens Wet Skin Moisturizer // I found this to be a bit sticky, but I'm all about the coconut oil. I threw it in my duffle to bring with me on trips because I did find that my legs were very soft in the morning. La Neige BB Cushion Foundation Sample // I really liked this! Although they sent 3 little samples, I could only use the lightest shade, but I tested it for about 3 days. I found that it was not drying on my very dry skin, buildable coverage, and fairly long lasting. I don't know that I'd repurchase because there are drugstore options for about $20 cheaper, but it was fun to try! Eden Peppermint Shampoo and Conditioner // I haven't tried these, but I did smell them and they smell great! I think they're a pretty neutral set, made with NO sulfates or parabens (!!) and they're perfect for traveling. They also make one in coconut that I want to try next! Wet n Wild Proline Eyeliner in Black // Y'ALL, this stuff sticks. I'm horrible at eyeliner, so I liked that the tip is an angled felt tip which sort of draws the wing for you, but even the smallest mess up is hard to recover from. I tried to smudge it away and Myles immediately said I looked like a racoon. Good for staying power, not so good for newbies! Derma E Hydrating Day Creme // I love this stuff, but be warned, it has a very strong smell. That doesn't bother me, but If you're funny about smells, I would not recommend. Otherwise, I was happy to see it was paraben-free, sulfate-free, mineral oil-free, lanolin-free, gluten-free, and GMO-free. It is thick, but super creamy and makes my skin feel moisturized all day. It also has hyaluronic acid which helps to repair tissue, tighten skin, and help with anti-aging. All in all, I'm a fan! Chapstick 3 in 1 Tinted Lip Balm in Coral Blush // see my review above! Overall, this box has a retail value of $27, which is pretty good considering I only paid $7 and it ships for free! It comes with a $3 off coupon and because the products are all sold at Target, there's no risk of falling in love with a super expensive product. If you're looking for a beauty box with good products but isn't too much of a risk, I'd highly recommend it! You can buy the November box here! P.S. - My Subscription Addiction also did a review, with MUCH better pictures of each item (I'm still learning) and you can sign up for updates when a new box comes out, so you never miss out!